Art Student vs. 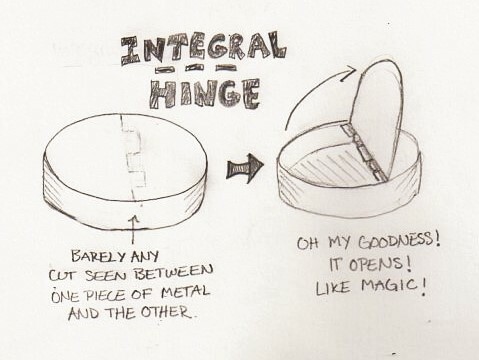 The Integral Hinge! And Fight! Fall semester is in its second week and I have my first project: The Integral Hinge. Suffice to say, this project is a little outside of my norm and just a few centimeters outside my comfort zone. It’s highly technical, requiring precise (perfect, meticulous, exact) use of both tools and materials. One swipe too many of a file can mean starting that part of the piece over from the beginning. Being off by half a millimeter is like being off by a mile. I’m exaggerating a little, but not all that much. The first project for my jewelry and metals class this semester has few limitations other than it must include an integral hinge. What is an integral hinge? I certainly had no idea until the project sheet was handed out. It’s a hidden hinge, meant to leave barely any evidence that there is a moving part anywhere on the piece. Basically, I have to make a secret door. I am pretty excited! As I said, it’s a bit out of my comfort zone since most of what I do has more wiggle room during the technical parts of cutting and filing. But I’m in good hands with this class. The second day of class my head was filled with so many little amendments to technique for filing that I thought my head might explode. It was just about the best head nearly exploding feeling I think I’ve ever experienced. I believe it’s good to step outside my comfort zone with my art. It means growth and experience and generally getting better at what I want to do most. Sure, it’s a little daunting, but I’m an artist, not a doctor! If something goes wrong I try again. No trauma. It’s easy to keep doing the same things over and over again. And I think, in some cases, like selling in a gallery, the repetition is useful. But to keep making interesting things I need to try new techniques. Of course, I probably could have toned down my idea for this project. The theme I chose for this project is honey bees and how important they are to the environment. Which means I get to keep working with my favorite obsessions of trees and flowers and – this is a new one – bugs! And I want to take my layered pieces to the next level. For the moment, this means more layers. 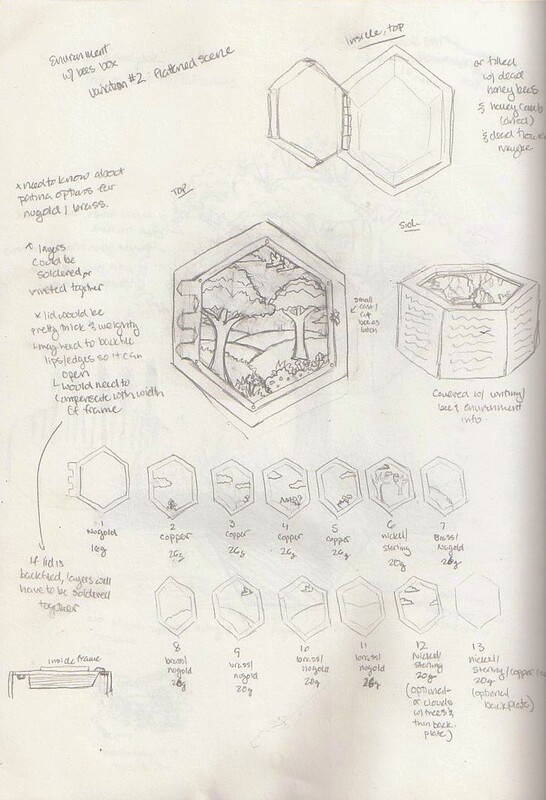 But mostly, I really want to make a box! I love interesting little boxes and I’ve never made one before! Somehow honey bees will be worked into the inside of the box. There are between eleven and twelve layers for the lid. I’ve never tried that before and it will have it’s own problems and technical issues to work with. Once again, the professor noted it was an ambitious project. This seems to be a recurring statement in every class I take. But, to me, it seems like a great way to learn as much as I possibly can! I have about three weeks, so time to get started!